In modern society, copyrights prove claims to authorship in music. In the past, too, great songwriters are immortalized as the formants of a genre–Cole Porter and George Gershwin are among the composers who churned out music to popular consumption. However, folk songs are traditionally passed along orally, and often authors are lost amidst the many additions and changes. Does embellishing and editing a previous author’s work remove the credibility and culture of the original message of a piece? “The Battle Hymn of the Republic” is typically a piece played in a militaristic style–a strong brass section, lots of snare drums, and in this YouTube clip, an obnoxious animated American flag. Its patriotism is not a new appropriation, but rather began during the Civil War when marching soldiers of both sides sang what was then “John Brown’s Body.” Although the John Brown the lyrics were written for was a soldier of the Massachusetts regiment and therefore a Civil War figure (PBS), he was not the one immortalized in the song. 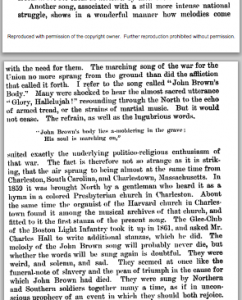 Rather, the abolitionist John Brown became the martyr the lyrics remember. 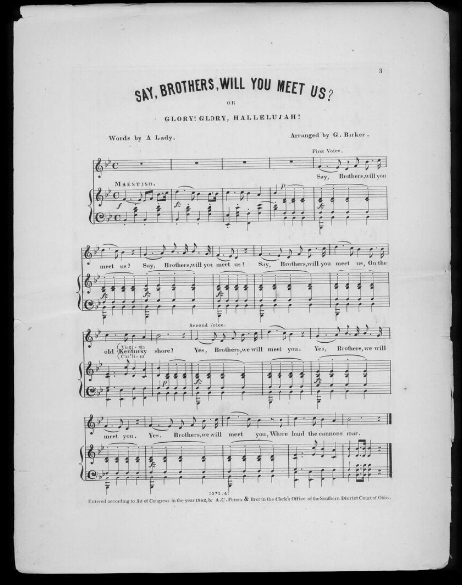 Both sides of the war sang this song, changing the words to fit their message (Library of Congress). But perhaps it is most appropriate that the northerners, with their message of freedom for the slaves, won the war and the song, as it had descended from fragments sung at ring shouts by the very slaves themselves. HELEN KENDRICK JOHNSON. The North American Review, 1884. 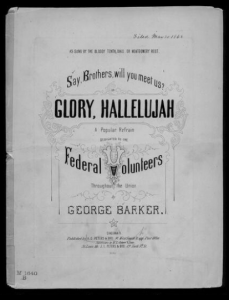 The score for this hymn is not the complete beginning of “Glory Hallelujah,” but rather only the version sung by congregations at revivalist meetings and in stricter church settings. Some scholars attribute the musical phrases and lyrics to ring shouts (Soskis 24-5). 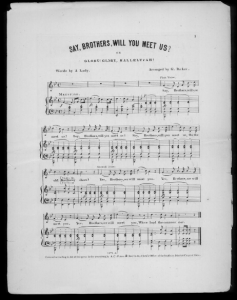 It is easy to imagine the call-and-response singing of the Biblical lyrics, along with interjections of “Glory, hallelujah!” In addition, the same message of escape, travel, and lands of ‘happy shores’ is evident in this piece as in many other slave songs. Like many folk songs, spirituals, and hymns of early America, authorship is highly disputed. Claims of ownership come from many different sources, and usually the privileged, educated members of society have the most lasting paper trails. But the strong presence of a black musical tradition is evident in the very roots of music in America. 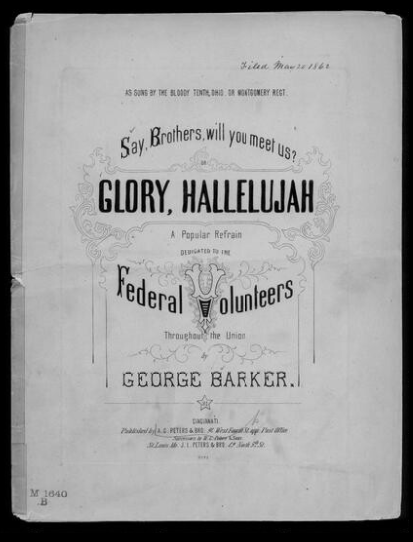 White Northerners may have appropriated the traditional tunes and modified the lyrics, but it is a grand image to imagine soldiers singing a song reminiscent of the cause of freedom to its very core. Johnson, Helen Kendrick. The North American Review. May 1884. Accessed from Proquest. Linder, Douglas O. “Famous Trials,” University of Missouri-Kansas City School of Law. 2015. Web. http://law2.umkc.edu/faculty/projects/ftrials/johnbrown/brownbody.html.